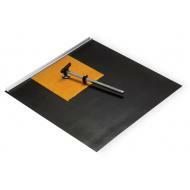 Includes 24 in x 24 in (61 x 61 cm) pad with combination strip and circle cutter. Ideal for students and on-site work. Roll it up and take it along! #7183 Angle Cutting System sold separately.